Lycaeon pictus. 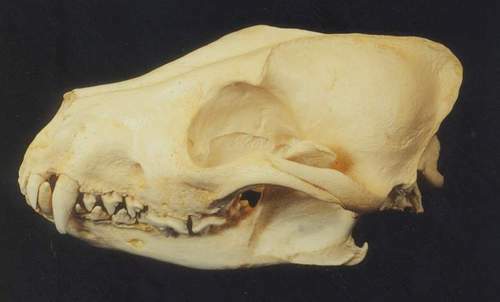 Canidae. Single species. Lived in most of Africa south of Sahara and Egypt. Skull cast measures 187mm/7.4 in. 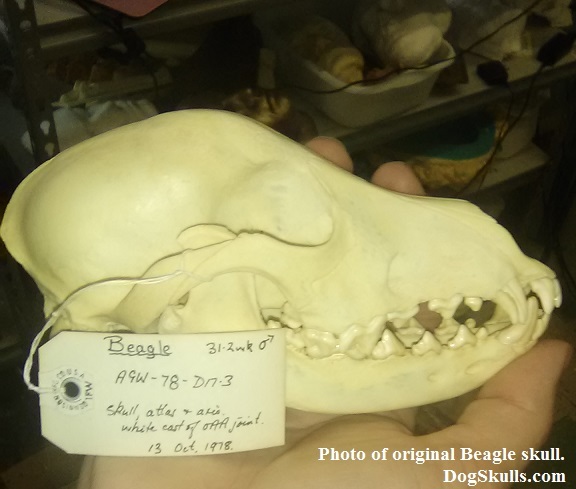 We found the best Beagle skull we could find and have molded and cast it in the finest resin to accurately display the tiniest detail of the original. 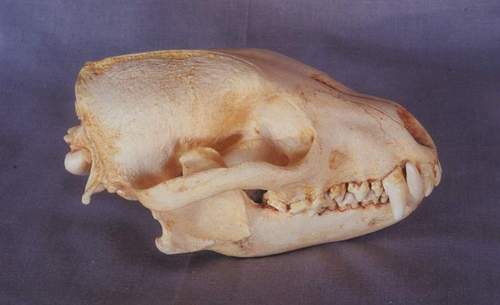 This skull is of a 31-32 week old male. From the collection of a retired veterinarian. This skull was labeled with the following information on the tag: A9W-78-DN-3. October 13, 1978. 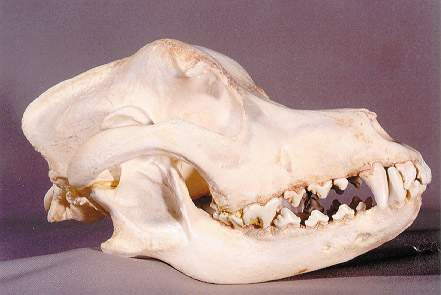 Canis Familiaris; The Boxer was bred from the English Bulldog and the now extinct Bullenbeisser and is part of the Molosser group. 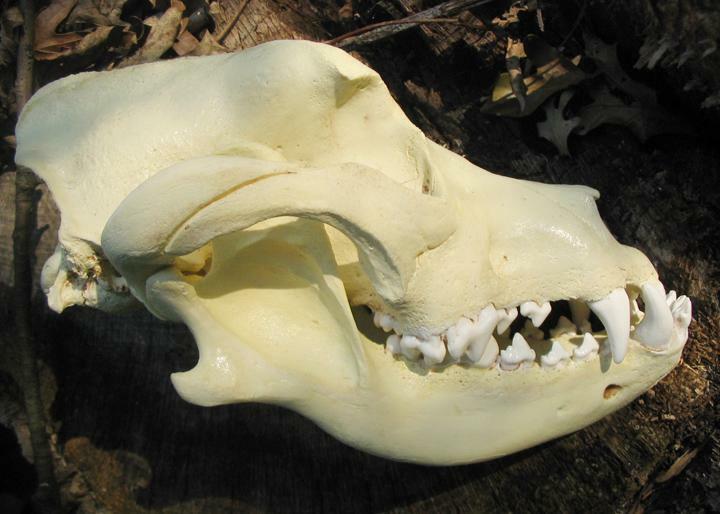 13th Century English breed from the Mastiff for sport bullbaiting. Polyurathane cast. Skull cast with lower jaw. The Bullmastiff is a powerful dog, which was originally a cross between the English Mastiff and the Old English Bulldog. Originally bred to find and immobilize poachers, the breed has proven popular as a family pet. Molded from an original skull and cast in resin. Skull cast measures 9.5" X 6" wide. Speothos venaticus. 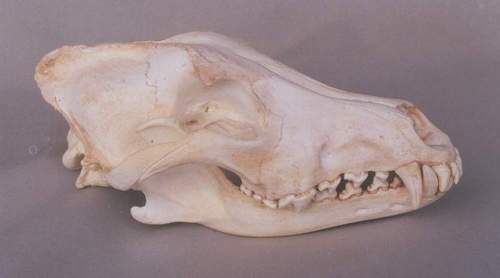 Skull cast molded from a female. Central and upper South America. Molded from a California Academy of Sciences specimen. South Siberia, E Khazakhstan-India, Indonesia. Dense montane forests. The Dhole hunts larger mammals in packs. 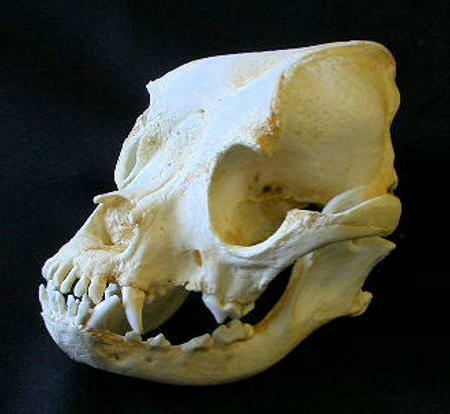 Thriving during the Pleistocene, the Dire Wolf is not a direct ancestor of any of today's known species of canine. 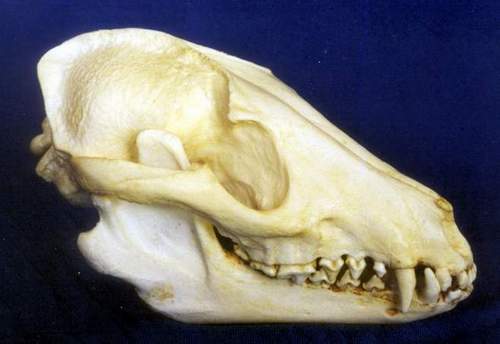 They once co-existed in North America with Grey Wolves. 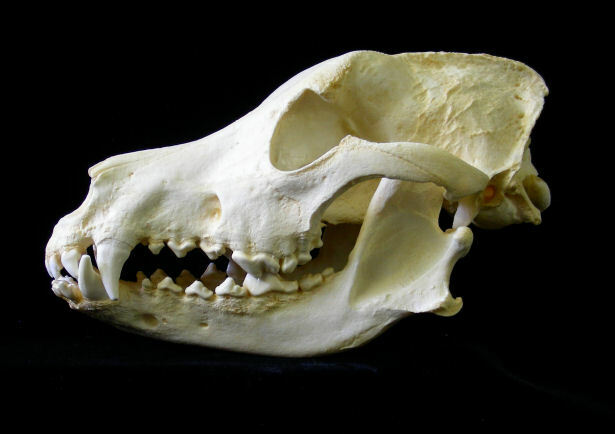 Dire Wolves had short, thick legs, a larger, broader skull and more massive teeth than the modern wolves. 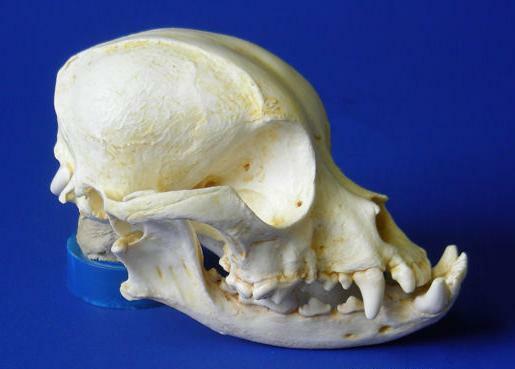 Their brain case is also notably smaller than their remaining canine cousins. Current belief is that they were likely scavengers rather than hunters. Remains of over 3,600 individuals have been recovered from the La Brea tar pits - more than any other species of mammal. This may also be an indication of their preying in packs on dead or incapacitated animals that were themselves trapped in the mire. 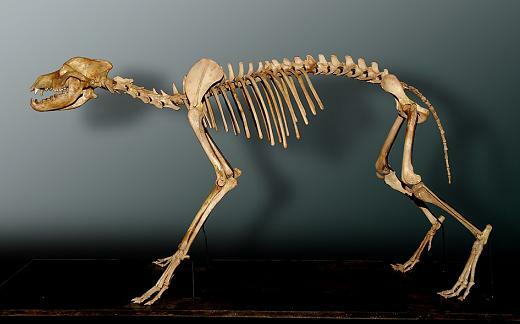 Dire wolf skeleton cast replica. 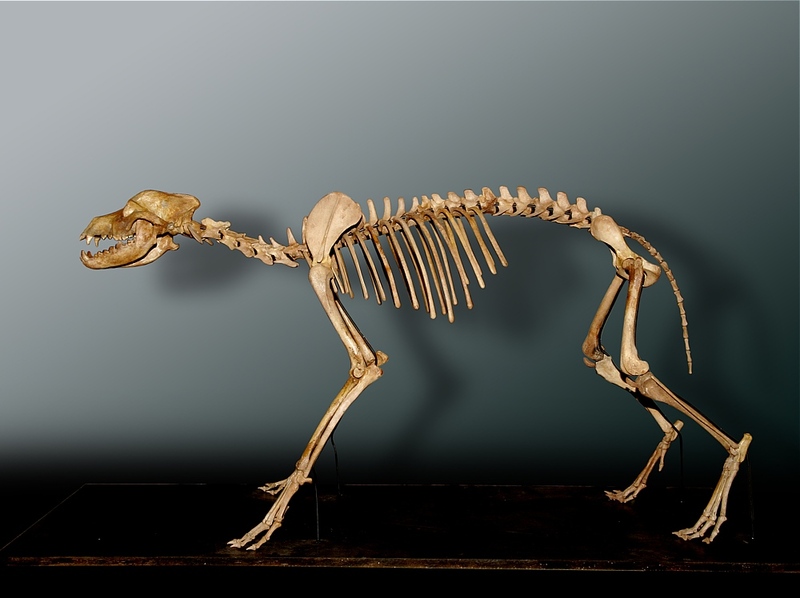 We also offer a Dire Wolf Skeleton cast (a different specimen than the skull shown above) cast replica $6,500 assembled / $ unassembled. The skeleton will require a crate for shipping. Crate cost $150 for unassembled or $275 if assembled. Shipping cost is not included. Canis familiaris. Human symbiosis, world-wide. Canis familiaris; The German Shepherd, as its name suggests, originated in Germany in and was used primarily as a sheep-herding dog. Today, this popular breed is used by the military, police and as a personal guard dog. The German Shepherd is a medium to large sized dog. First bred in Germany. Used to hunt Boar and Stags in the 17th century. 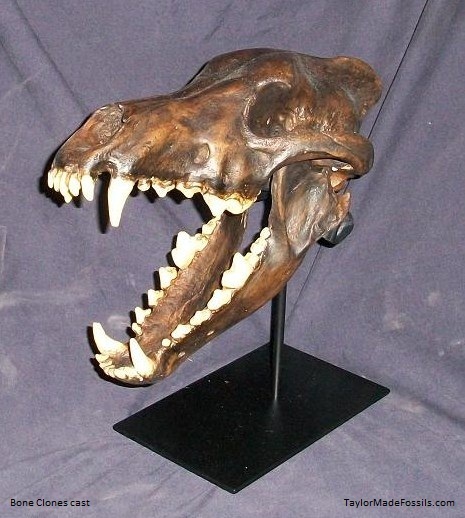 Hesperocyon gregarius skull cast replica. 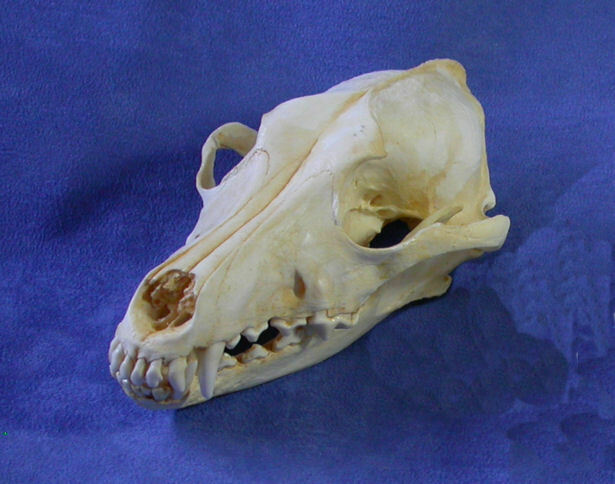 Skull measures 3.9in (100mm). Green River Formation. Wyoming. 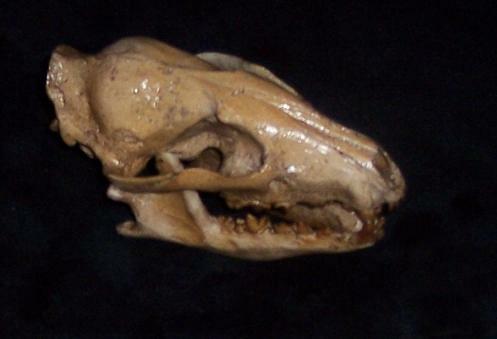 A tree climber, Hesperocyon is the most common dog of the Oliogocene. 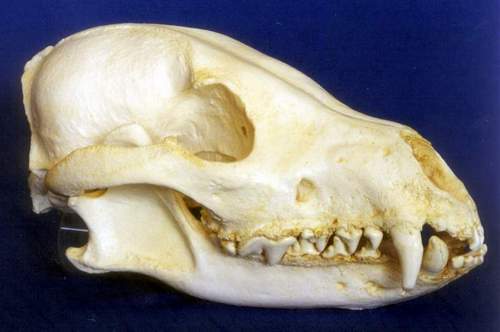 Hesperocyon is an extinct genus of canids (family Canidae, subfamily Hesperocyoninae). From the Duchesnean North American Land Mammal Age (NALMA). They were the favored pet of the Chinese Imperial court, and the name relates to the city of Beijing where the Forbidden City resides. The breed has several characteristics and health issues related to its unique appearance. Polyurathane cast. 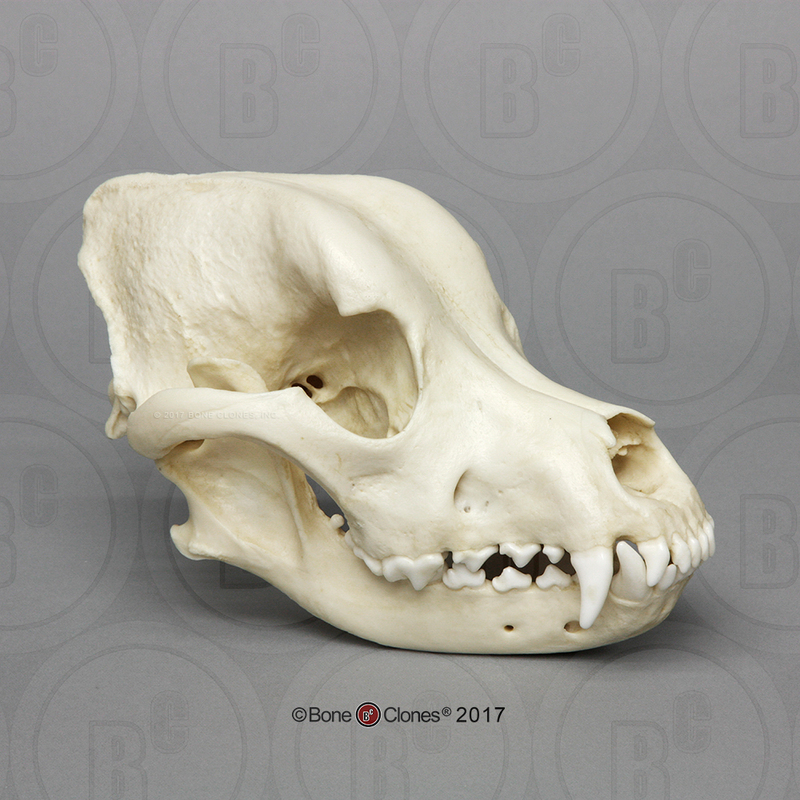 This skull was beautifully molded and cast from our original skull (which came from a natural death - the original skull is being donated to a local vet). 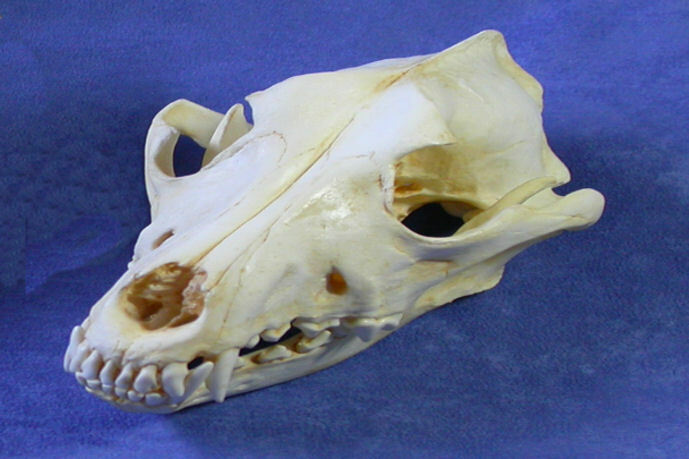 We hope this skull will help educate veterinarians and the public alike. 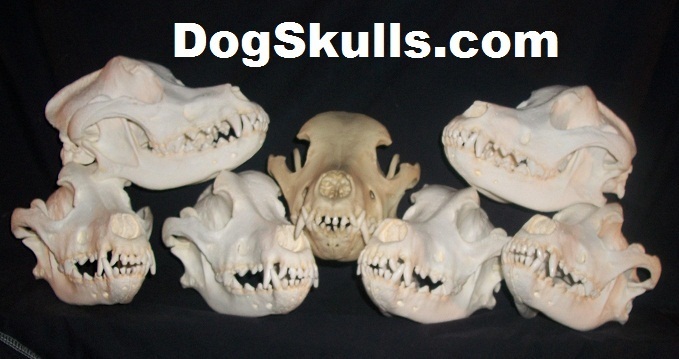 By providing high quality cast replicas the sale and trade of real skulls is no longer necessary. My profits from the sale of this cast replica will go to help low income families spay and neuter dogs and cats of all breeds. We also vaccinate, and find safe loving homes for strays. Pit Bull is the shortened name for the American Pit Bull Terrier, although it is often used to refer to other terrier mixes (for example, the Staffordshire Bull Terrier). Bred and valued for its tenacious grip, the Pit Bull is a powerfully built dog, with strong jaws, a thick, muscled neck, and impressive chest. Today, if raised with care, the Pit Bull is a loyal guardian and good-natured family pet. Its height ranges from 18-22 inches, and its weight most commonly falls between 35 to 55 pounds. From South east Siberia, Japan, E Europe, Baltic States. Lived on forest and stream vegetation. This powerful medium-large dog breed is known to be an excellent guard dog. The Rottweiler, or Rottie, is one of the oldest herding breeds, likely tracing its ancestry back to Ancient Roman times when Mastiff-type dogs were bred to herd and guard cattle, 'food on the hoof' for military campaigns across Europe. One such campaign in AD 79 led to the settlement of an area in the southwest of present day Germany now called Rottweil. Local, utilitarian dogs, descended from Roman drover dogs that were bred and used by butchers to pull carts laden with meat to market and to guard money pouches, became known as Rottweiler Metzgerhund (Rottweil's butcher's dogs). 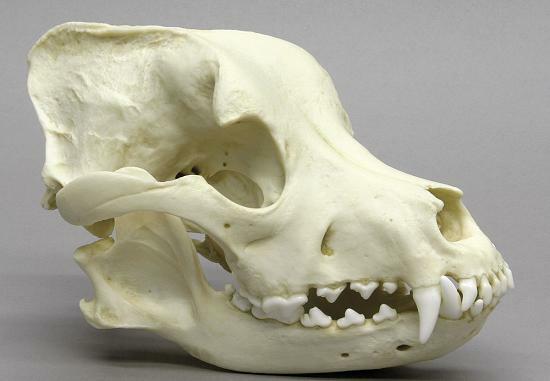 This breed's bite force has been measured as stronger than both a German Sheppard Dog and a Pit Bull, but less than its wild cousin, the wolf. 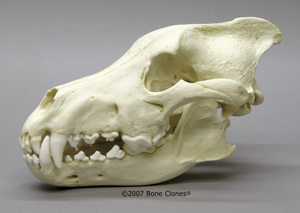 Bite strength in dogs corresponds to the shape of the jaw and the size of the dog's skull. The domestic dog is believed to have diverged from its wild wolf ancestors, and may be the most morphologically diverse animal species. 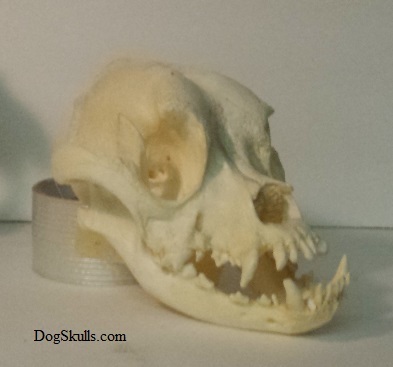 Singing Dog Female skull cast replica. Canis hallstromi. A New Guinea dingo with unique canid vocalizations. Polyurethane cast molded from a private collection. 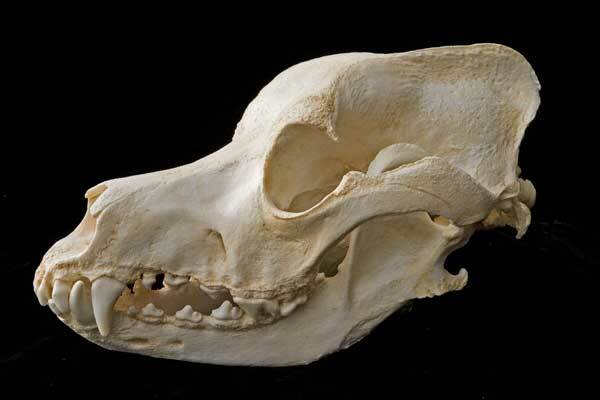 The New Guinea Singing Dog (Canis lupus hallstromi), known as NGSD, New Guinea Highland Dog, or Singer, is a type of wild dog that is native to New Guinea, classified as a subspecies of Canis lupus and related to the Australian Dingo. Singers have remained isolated from other dogs for thousands of years, making them possibly the oldest of the pariah dogs. Once thought to inhabit the entire island of New Guinea, today dwindling wild populations are thought to still exist in the Highlands. No wild specimens have been sighted for years, but explorers and natives insist that they have heard their calls during the night. Some exist as pets today in the United States. Canis hallstromi. 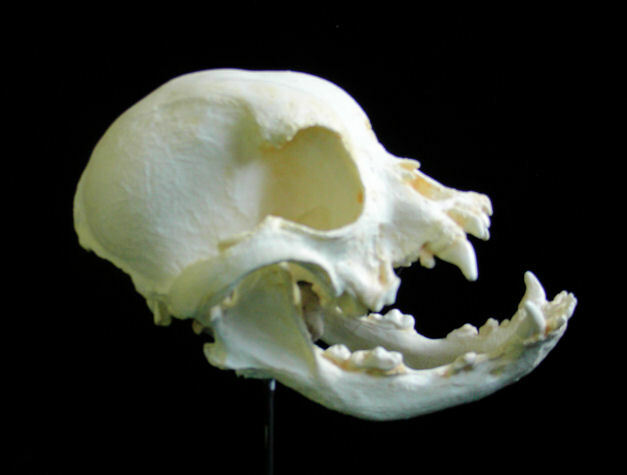 Male skull. A New Guinea dingo with unique canid vocalizations. 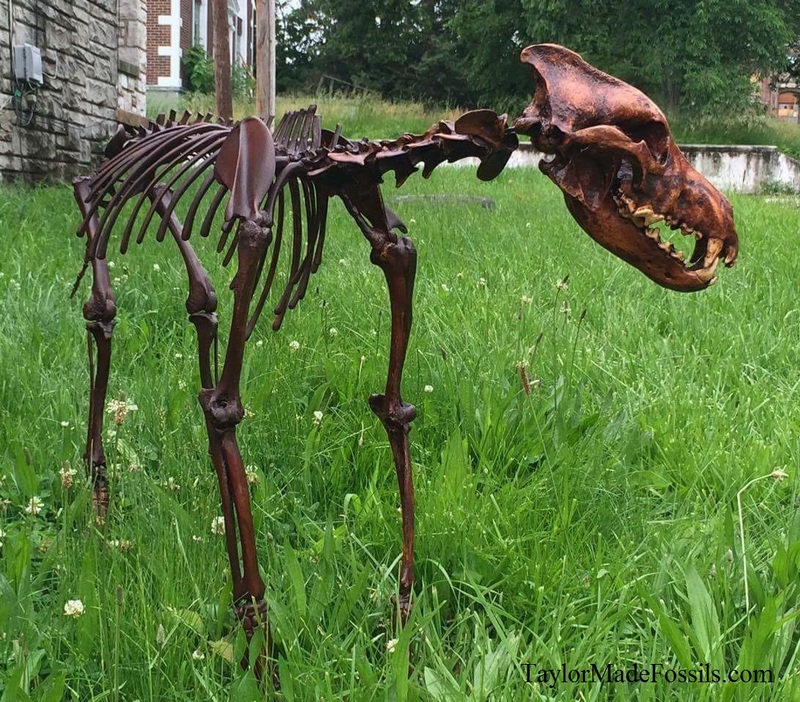 Real Fossil Pleistocene wolf skeleton for sale. Price (varies by specimen. Please call (314) 556-0650 email us for price and availability. This species is found in Alaska, Canada, northern Europe and Asia.